A major hailstorm in Colorado has left motorists with shattered windows and dented body panels. A spectacular dashcam video shows hailstorm bursting into life on a freeway has emerged. The storm, which devastated thousands of people's vehicles and properties, scattered baseball-sized hail across the Denver area. Many businesses were affected, including the Colorado Mills Mall, which reported millions of dollars in damage. 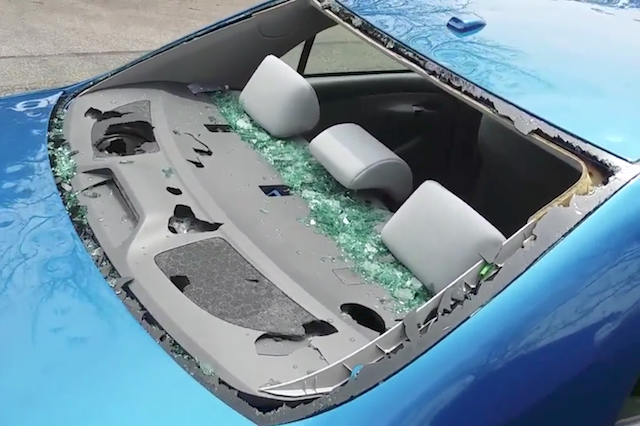 In the video, the hail gradually builds, initially cracking the screen of the blue Toyota Camry. The driver casually states 'well there goes my windshield' and continues on his way; however, he is soon forced to pull over as the screen continues to crack and crumble. Soon, the rear window of the car gives way entirely, and much of the bodywork takes a heavy beating from the continuing onslaught. At the end of the video, the driver examines the damage, and we can see that even the cars badge didn't survive. The storm was estimated to be the costliest in Colorado's history, with The Rocky Mountain Information Association telling USA Today that damages could exceed $1.4 Billion (£1.07 Billion).